Not long ago, you could walk down North Davidson Street and hear faint acoustic guitars playing on the side streets. Gallery crawls would keep crowds bustling down the main thoroughfares. If the wind blew just right, you might hear clanking weights from a gym down 35th Street. These days, with the LYNX Blue Line extension expected to be completed in 2017, you're more likely to hear jackhammers, hammering and sawing. It's in the air. NoDa is changing. With a light rail station planned on 36th Street toward North Tryon Street, the city is expecting significant urban development in the coming years. In 2013, a concept plan was released for the area that shows a large swath of land between North Davidson and North Tryon designated as "Transit Oriented Mixed Use" property. So, it's no surprise that a seven-acre parcel of land between 36th and 35th streets, currently zoned as industrial, is up for rezoning as mixed-use. While development is a foregone conclusion as Charlotte grows by leaps and bounds each year, residents — especially those in NoDa itself — worry niche neighborhoods are going to lose their character. A new building can boast the vibe of an area, but popular businesses — such as the Chop Shop and Ultimate Gym, which are currently renting space from Merrifield Properties on that seven acres in question — could be cast aside in the process should proposed plans go through. Developments are going up all around the Chop Shop thanks to the future light rail line, which is scheduled to finish construction in 2017. Crescent Communities is in talks to purchase the property contingent upon the rezoning. A public hearing, where people can speak out for and against the proposal, is scheduled for March 16. There, Crescent only has to present general site plans along with its application and filing fee for the property rezoning, says John Kinley, principal planner for the city of Charlotte. The planning board will give their recommendation to City Council on March 25, who will then vote on the rezoning on April 20. Should it be approved, ground-breaking would take place later this year with project completion in 2017, around the same time as the opening of the light rail station. Crescent would first have to submit plans for its property to the city's urban design committee for review to make sure it fits within zoning standards before construction would begin. 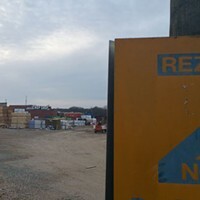 Should rezoning fail, a similar request could not be submitted to the City Council again within two years, according to the Charlotte-Mecklenburg rezoning process, and Crescent would re-examine its plans to purchase. At a March 3rd NoDa Neighborhood Association meeting, residents voted to support the rezoning by a 33-2 vote, with one abstaining. Many critics saw this as a vote against the Chop Shop and Ultimate Gym and a vote for the development. Some association members admitted they are worried what will be built there, but supported the petition anyway, mostly out of fear of the unknown. So far, Crescent, which has been under contract since January to purchase the land, has sought resident input on what will be constructed on the site. Open lines of communication are not the norm when it comes to development and construction, and that's what residents have responded to the most. 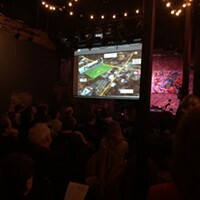 "The only issue that the Neighborhood & Business Association ever had any power to consider was working with the new owner, or in this case, proposed owner, of the property ... Crescent, to date, has been willing to work with the neighborhood," Hollis Nixon, the neighborhood association's president, wrote in a Facebook post. "From an association standpoint, these efforts have been unprecedented. 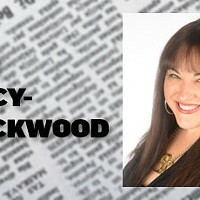 The association has no say on the businesses closing. ... Nobody wants to see Chop Shop or any other business go, but the association doesn't have any influence on this." Ben Collins, regional vice president for Crescent Communities, says the project's success will be determined by its integration into the neighborhood. 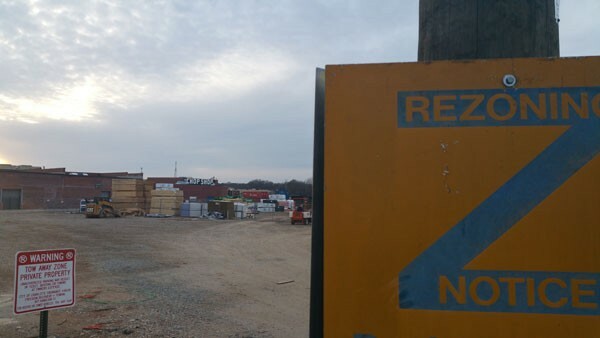 Collins, a former NoDa resident, says they are looking at what the immediate interests are for the property when it comes to any commercial businesses that will be contained, but there are no guarantees because it is also dictated by the market. "We have a strong desire and responsibility to enhance the neighborhood and create a really positive and strong connection to transit and create a new front door to NoDa," Collins says. "We are fully committed to keeping the neighborhood engaged throughout the design and planning process." Crescent, which has been in the Charlotte area for 65 years, is currently completing its Crescent Dilworth project and has future projects planned that include bringing a Whole Foods to Uptown. A rezoning application has been filed for the NoDa property that includes the Chop Shop and Ultimate Gym. WITH THE CHOP SHOP and Ultimate Gym renting their spaces, there is little recourse for their futures. 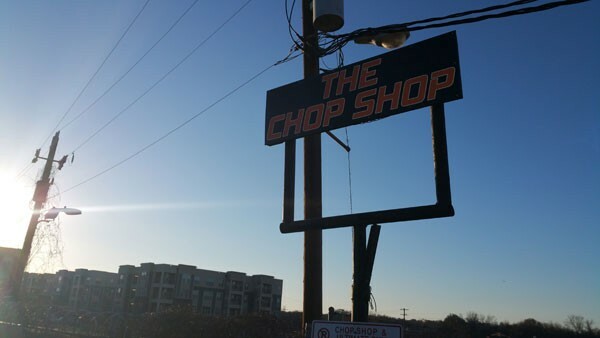 An online petition asking the NoDa Neighborhood Association to support the Chop Shop had more than 1,300 signatures as of press time. Both businesses are keeping options open while the rezoning remains up in the air. Many people voicing their support for the businesses hope they will relocate as CrossFit NoDa has — going from its home inside the Ultimate Gym in the old NewCo Fibers Mill to a warehouse space at 624 Anderson St.
"We knew in 2009 that this would possibly happen, and were given one year's notice last year about potential development coming," CrossFit NoDa owner and former Ultimate Gym manager Kevin Brafford, says. "We went ahead and relocated [CrossFit NoDa] before everything else in the area was gobbled up. We found a spot on the north side of the neighborhood. There's a lot of empty warehouses, but it's tough to reach a landlord. Hopefully we won't have to do this again in two years when the light rail goes through." The Chop Shop's current lease runs through 2018, though there are contractual contingency clauses in place should the land be redeveloped. 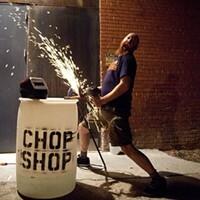 Chop Shop owner Jay Tilyard says he hasn't been given any specific timeline to work with at this point, so it's business as usual. "Until they trigger that part of the contract, nothing's changed," Tilyard, who opened the Chop Shop in May 2011, says. "I'm not an idiot. I know something's going to happen. Whether people rally and give us more time or not, our lease was only for a certain time in the first place. We've got a few options in the works right now — we could relocate, start something new, join another venture or just take time off, sit back and chill and figure out what to do next." Doug Brafford, Kevin's father and owner of the Ultimate Gym, says he was originally given notice last summer that he would need to move by July 2015, but then was told nothing might happen in 2015. He's currently in more of "a month-to-month situation" as things develop with the rezoning hearings. "I've been looking for buildings since they told me I had to be out in July," Doug Brafford says. 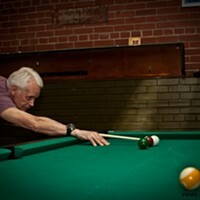 "If I can find a building that's big enough for what we've got, it'd be great [to stay in NoDa]. I need something that's at least 20,000 square feet." The question marks have already impacted Doug's business. Aside from CrossFit moving, Doug Brafford says he has also seen some turnover in clientele: People want to train and aren't sure if Ultimate Gym will be there in another month or two. "People have goals and plans, so I can't blame them," he says. "Even if the rezoning doesn't happen this time, it's going to happen eventually. I know that. We knew it would happen when I signed the lease, but nobody has been given me a timeline of when. Crescent is saying all the right stuff right now, but they're developers. There's nothing holding them to keep the neighborhood looking like it does." Though nothing has been finalized for the development, Crescent discussed at the March 3rd neighborhood association bringing in more trees, incorporating local artists or artwork and installing a potential bike station. They're considering a brewery, grocer or restaurant. Apartments, a parking deck and a potential hotel with a height of up to 80 feet also tentatively made their way into the conversation. Descriptors included "lots of glass," "deconstructed feel" and "quirky furniture." "We've had a lot of interest from different types of tenants, so it's about finding the right mix for this development," Collins says. "At the end of the day, it's our vision as an organization to build communities and better people's lives. It's not just something we say, but something we believe and are passionate about. We can only achieve that by listening to what people want to see and doing our best to balance that with what's achievable. NoDa will be the most transit-accessible neighborhood in Charlotte. There's a big responsibility for us at this site. Ask any other developer, and they're not going to have that same response. "I understand concerns about the ambiguity and flexibility we would have on the site — I get that. I believe very strongly that we'll do the right thing and be an asset for the neighborhood." While many questions remain, this much is clear ­— at some point in the not-so-distant future, the hammers will stop nailing and the buzzing of saws will fade away. Residents are only left wondering what will be standing when the dust settles.